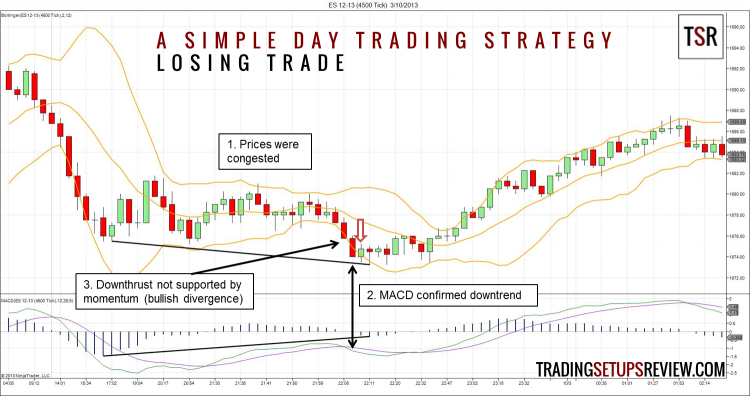 This simple day trading strategy was published on TradingMarkets.com by Markus Heitkoetter, a day trading coach from Rockwell Trading. He is also the author of The Simple Strategy – A Powerful Day Trading Strategy For Trading Futures, Stocks, ETFs and Forex. This day trading setup uses the MACD indicator to identify the trend and the Bollinger Bands as a trade trigger. In his article, Markus Heitkoetter used the trading time frame of 4500 ticks for S&P E-mini contract. It means the chart plots a bar every 4500 trades. To keep things simple, we followed the recommended timeframe. The day started off in congestion before having a nice bear run. This simple day trading strategy managed to catch the beginning of this bear run for a nice profit. Let’s take a look at this trade in detail. We had the most potent bull run of the day here. However, this higher high coincided with a lower high on the MACD histogram. This occurrence is a bearish divergence, a warning sign for reversal. This bearish divergence set an excellent context for short trades. Here, prices fell, and MACD moved below both the zero line and its signal line. That was our cue for a downtrend. A sell stop order was placed at the lower Bollinger Band to anticipate a short trade. After the MACD had confirmed a downtrend, a bullish outside bar formed but had little follow-through. It was the last bullish attempt before prices broke down further. Finally, as prices pushed through the lower Bollinger Band, our sell stop order was triggered. And we have a winner. Just like the first chart, this is a 4500 tick chart of the S&P E-mini contract on a full Globex session. The simple day trading strategy triggered a short trade at the red arrow. It was the worst entry point for us. Let’s break this down and try to understand what was going on. The day started off congested as shown by the increasing tails and smaller bodies on each candlestick. The constricting of the Bollinger Bands was another indicator that volatility was dropping. However, the downthrust punched out a lower low that was not supported by the MACD momentum. That was a bullish divergence that warned us against taking this trade. Ultimately, this breakout downwards turned out to be a morning fake reversal. We entered short at the low of the day. Using only two indicators and two simple steps, this is indeed a simple day trading strategy. I have tried it on different time frames and found this day trading strategy to be surprisingly robust for catching breakout trends. 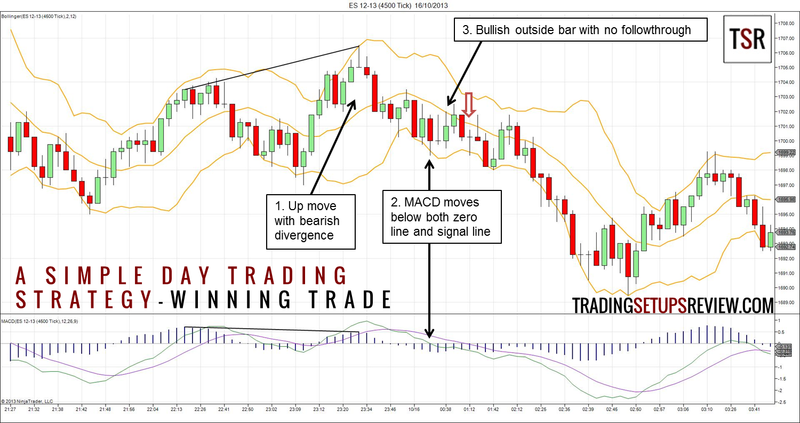 By demanding that the MACD rises not only above its signal line but also its zero line, this day trading strategy can locate short-lived intraday trends. This application of MACD is starkly different from Gerald Appel’s original basic MACD trade. If you want to restrict yourself to only high probability trades, take setups that occur after MACD first crossed the zero line. This rule will keep you in fresh trends and not the maturing ones that are more likely to reverse. There is a significant caveat about the exit strategy. I did not follow the exit method recommended by Markus Heitkoetter as I wanted to keep things simple. He used a certain percentage of the average daily range of the past seven trading days to determine his stop and target size. It is a sound approach based on volatility, but it increases the number of parameters involved. You have to choose how many days to include in your average trading range and the percentages to use for your stop and target sizes. You also have to ensure that these parameters are consistent with your trading time frame. Like what Markus Heitkoetter pointed out, he updates the tick setting for the instruments they regularly trade to account for changes in market volatility. So, unless you can keep up with adjusting those parameters, you might want to consider a more straightforward way to exit your trade. Tired of complicated trading strategies? Learn how to profit from the most straightforward two-bar pattern that anyone can spot. Which program do you use for tick charts? Is there a free solution? I use NinjaTrader for tick charts. It’s free for simulation trading, and you can get a demo account from any NinjaTrader compatible broker for data. You can take a look at https://www.tradingsetupsreview.com/ninjatrader-kinetick/ for details. thanks for these simple approach, it made my day, l was able to use it with my strategy for optimal entry and entry, make the market direction clear at a glance. and helps one see safer entry position and exit . Glad to hear that it’s working for you! Is this strategy applicable to any time frame? 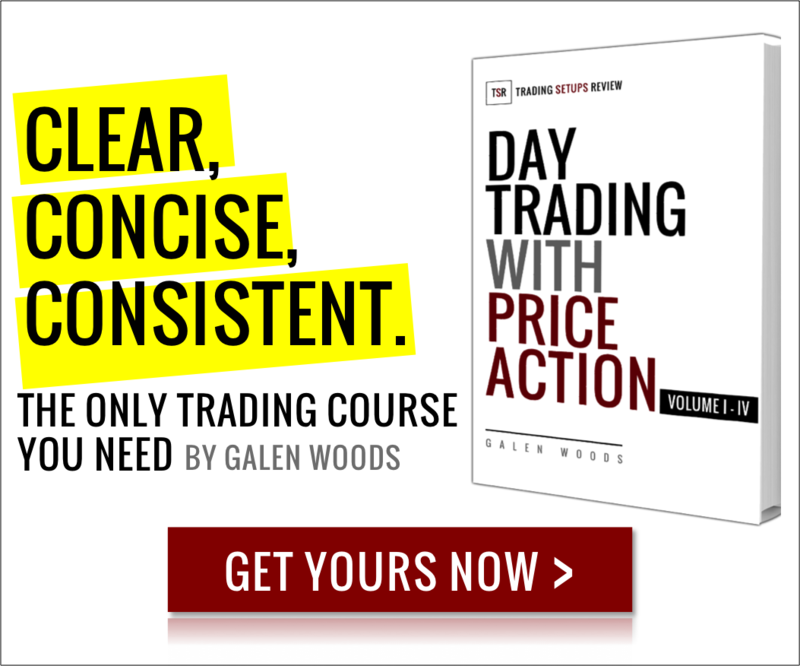 This strategy is designed for day trading, but you should be able to adapt it for volatile stocks on the daily timeframe as well. You will definitely need to experiment with alternative exit methods for swing trading. Sir can you sugest free chart for 1 minute to monthly. You can use the free NinjaTrader version for simulation trading for daily time frames and above. If you prefer a web option, you can check out TradingVIew. Hi Alberto, can you elaborate? How did you conclude that it was too soon? Hi Galen, thank you for uploading this. It has beneficial to my practice trading. is there a specific time frame that this strategy works optimal with? Hi Justin, glad to help! The optimal time frame depends on the market. But experimenting with tick charts is a good way to start, as this strategy was designed with tick charts in mind. I have coded this system in Amibroker and have been using this successfully on Bank Nifty for myself and clients. However I can not back test this as the strategy code does not give me that flexibility. I also use tick data which is only backs to 20 days. Please suggest what is maximum MDD % for this system. I had also added the bandwidth expansion to the check the rise in volatility. Thanks for the writing the system. Hi Sumit, adding a bandwidth expansion to track volatility is a good idea. The maximum drawdown depends on your exact tick settings and market, so I cannot suggest a figure here. The best approach for this is to try to load more historical data into your platform and backtest it. If that’s not an option, forward testing is the next best option. It is a 26,12, 9 ou 12,26,9 for the MACD? Hi there, thank you for asking about that. There’s a typo in the MACD parameters above. It should be 26 for the slow moving average, 12 for the fast moving average and 9 for the signal line. The slow and fast were labeled wrong, and I’ve corrected them.